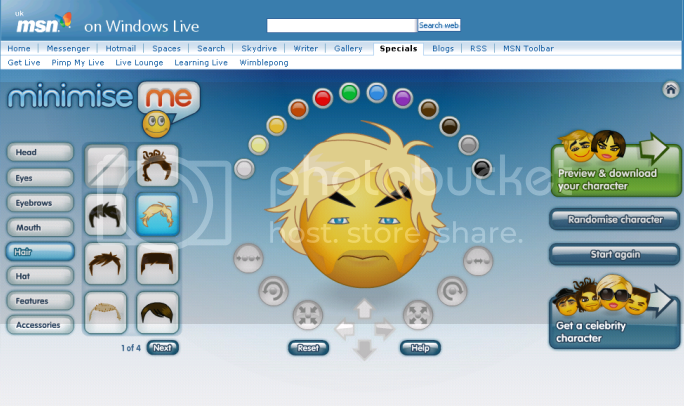 Microsoft has come out with a cool service known as Minimise-Me which allows users to create their own emoticons and characters which can be used in Windows Live Messenger. Creating your own emoticon is pretty easy. You can do it in just a few clicks. You can set different hair styles, eyes, mouth, accessories, etc. After you finish playing with it and you’re satisfied with the outcome you can download it to your pc and display it in your WLM window. Sounds like yahoo avatars? Isn’t it? There’s a celebrity gallery which consists of several well known celebrity emoticons. I enjoyed playing with a few, they look really cool.